There's something out there in the dark. There's always something reaching for you. And sometimes there's someone you can call. Someone you can hire. Someone who knows these dark streets and back alleys. Someone who knows how things work in this part of town. Private eyes who are often as dark as the things they hunt. Investigators who know how to look in the shadows for the things that go bump. Good guys but not always nice guys. 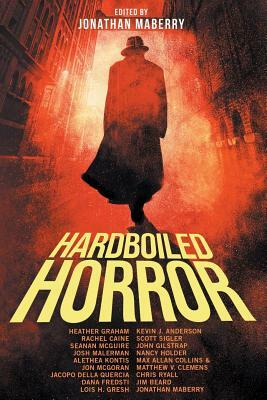 Hardboiled Horror collects fifteen original tales of noir mystery shot through with elements of horror and the supernatural. Occult detectives, paranormal investigators, seedy P.I.s, amateur sleuths and ghost hunters tackle the cases no one else can handle. The killer lineup includes Heather Graham, Kevin J. Anderson, Rachel Caine, Scott Sigler, Seanan McGuire Alethea Kontis, Jonathan Maberry, Chris Ryall, Dana Fredsti, Jim Beard, Jacopo della Quercia, John Gilstrap, Jon McGoran, Josh Malerman, Max Allan Collins & Matthew V. Clemens, Lois H. Gresh and Nancy Holder. Edited by New York Times bestseller and five-time Bram Stoker Award winner Jonathan Maberry.